Expect the Cardinals to contend yet again this season, but a thin offense and some injury concerns could put a ceiling on St. Louis' World Series hopes. This week, SI.com is previewing all 30 MLB teams for the 2016 season, counting down to the No. 1 team in the league. At No. 8: the St. Louis Cardinals. With six postseason appearances in the past seven seasons and a thriving player development system, the Cardinals are as close to a perpetual contention machine as there exists in baseball. The rotation should be a stronger one than they finished the year with: Adam Wainwright is recovered from last year's torn Achilles tendon, both Carlos Martinez and Michael Wacha are more able to handle full complements of innings after some late-2015 growing pains, and Mike Leake is aboard to replace Lance Lynn, who underwent Tommy John surgery in the fall. Korean reliever Seung-hwan Oh, who led the Japan Central League in saves in each of the past two seasons, should bolster the bullpen, and he's already got two great nicknames: "The Final Boss" and "Stone Buddha." As for the lineup, St. Louis still has one of the game's most underrated players in Matt Carpenter atop it, and while there's no getting around the loss of Jason Heyward to the division rival Cubs, the increased playing time for Stephen Piscotty, Randal Grichuk and Tommy Pham should help to minimize it. The team can hope that both Matt Adams and Matt Holliday bounce back from injury-plagued seasons, and the acquisition of Brayan Pena gives them the Cardinals their most capable backup catcher of Yadier Molina’s tenure, and in turn, a better chance at keeping their 33-year-old, four-time Platinum Glove-winning starter healthy. 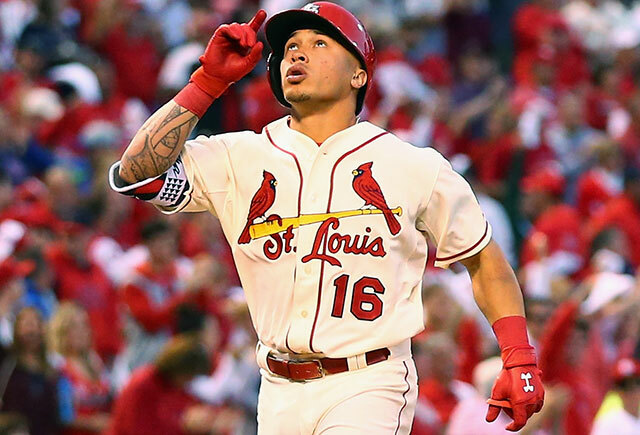 The Cardinals ended last season quite banged up, and they're already dealing with injuries again, having lost Jhonny Peralta until around the All-Star break due to a torn ligament in his left thumb that required surgery. With just-signed Ruben Tejada and off-season acquisition Jedd Gyorko likely to be his primary replacements at shortstop, the team’s offense and defense will both take a hit. Meanwhile, Molina is trying to come back from a pair of surgeries to his own left thumb, putting his Opening Day availability in question. That won't make it any easier to rebound from his worst season at the plate since 2006, and it may be that the 33-year-old backstop's days as a significant piece of the offense are at an end, though his defensive value and ability to handle pitchers are hardly in question. Adams is coming back from a severe quad injury that required surgery, and the 36-year-old Holliday is trying to recover from quad problems that limited him to 73 games; there's no guarantee the pair will account for 35–40 homers as they did in 2013 and '14. For as impressive as Grichuk, Piscotty and Pham were in limited duty last year, none has a full major league season under his belt, and with Heyward, Jon Jay and Peter Bourjos gone, the team's considerable outfield depth has been depleted. The recent recipient of a five-year, $25.5 million extension, the 25-year-old Wong is a solid player but still has some significant holes in his game. In his second full season, he hit .262/.321/.386 with 11 homers, 15 steals and a 92 OPS+, right in line with the average NL second baseman (.266/.319.384). In the field, he was five runs above average according to Defensive Runs Saved en route to 2.2 Wins Above Replacement. There's no shame in any of that, but there's plenty of room for Wong to improve in several areas—or for manager Mike Matheny to lessen his exposure and minimize the impact of his deficiencies. Wong's 5.5% unintentional walk rate was the lowest among the team's regulars and hardly befitting a player who made nearly half his plate appearances in either the leadoff or No. 2 spot in the order. His 65% success rate in stolen bases (eight times caught stealing in 23 attempts) was subpar, and a significant drop from his 83% in 24 attempts in 2014. He also tailed off badly in the second half (.238/.292/.322) after a strong start (.280/.343/.434 before the All-Star break) as he pulled the ball with less frequency and saw significant declines in his batting average on balls in play and power. Finally, he was just dreadful (.229/.275/.277 in 178 plate appearances) against southpaws despite plenty of exposure. The acquisition of the lefty-mashing Gyorko was aimed at offsetting that last problem, but he may wind up playing a significant amount of shortstop in Peralta's absence. Among their other shortstop/utility options who could free him up for a platoon, the righty-swinging Tejada has hit .281/.363/.355 against lefties in his career for an OPS about 90 points better than against righties, and minor leaguer Aledmys Diaz, who got a long look in spring training, hit .371/.431/.621 in 137 PA against lefties at Double and Triple A in 2015. In other words, the team has options to work around Wong’s issues against lefties, though the superiority of his glove work may carry the day, increasing the need for him to shore up his other flaws. That's where the Cardinals' first basemen ranked on offense in the NL last year, with a .702 OPS via a .238/.310/.392 line. Adams was hitting just .243/.281/.375 with four homers when he strained his right quad trying to run out a double on May 26—an injury that required surgery, cost him 3 1/2 months and limited him to just 31 plate appearances upon returning in September. The team used six other players at that spot, including the since-departed Mark Reynolds, deadline acquisition Brandon Moss, midseason callup Piscotty and others, but collectively, they were a drag on that offense in that capacity. The easiest way to upgrade that spot would be for Adams to recapture his 2013–14 form (a combined .287/.327/.474 for a 121 OPS+ with 32 homers), though a platoon complement is still a necessity given his career .197/.230/.317 line in 230 plate appearances against southpaws. The team has put the righty-swinging Piscotty's further dalliance at the position on hold; meanwhile, Holliday showed up to camp having taken the initiative to start learning the position over the winter, and the early returns have been encouraging. With Peralta out in favor of what will inevitably be a lighter-hitting replacement and Molina in decline, the Cardinals simply can't punt offense at first base and expect to win 100 games again. "He strikes out way too much, and the league will make adjustments to him.​"
"He will give this team tons of innings and keep them in every game he starts.​"